In the Manage Subscriptions tab, the myHEALTHware organization administrator will have the ability to choose what myHEALThware features the organization will offer for patients with a Basic Subscription and patients with a Premium Subscription. Basic Subscription: Features that are designated as Basic Subscription will be offered for no charge to the patient. Premium Subscription: Features that are designated as Premium Subscription can be offered to the patient for a annual subscription fee. The annual subscription fee can be designated by the clinic and your organization will receive 50% of this subscription revenue. 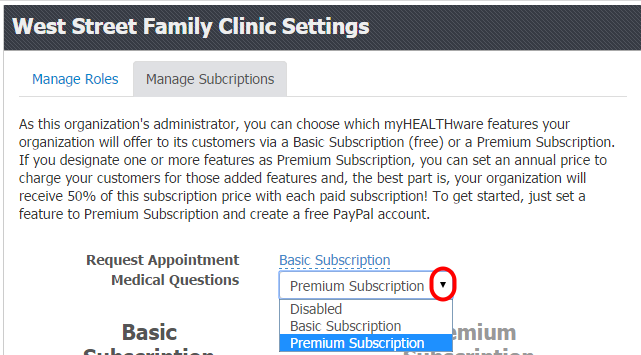 Using the drop-down menu, select either Basic Subscription or Premium Subscription for each available myHEALTHware feature. If you designated any features as Premium Subscription features in step 1, this will require you to create a Billing Agreement with myHEALTHware. The Billing Agreement allows myHEALTHware to split the revenue that is generated from the Premium Subscription fees that are collected with the clinic. The clinic should collect 100% of the subscription fee from the patient, then myHEALTHware will deduct 50% of the revenue using the clinic's designated PayPal account. To begin creating your PayPal account to use with myHEALTHware, click the Create Billing Agreement button. *Note: We recommend that you use a separate PayPal account that is designated specifically for your clinic rather than reusing a personal PayPal account. If you wish to use an existing PayPal account for your myHEALTHware transactions, please click the Pay with my PayPal account button. *Note: No payments will take place at the time of creating a Billing Agreement. 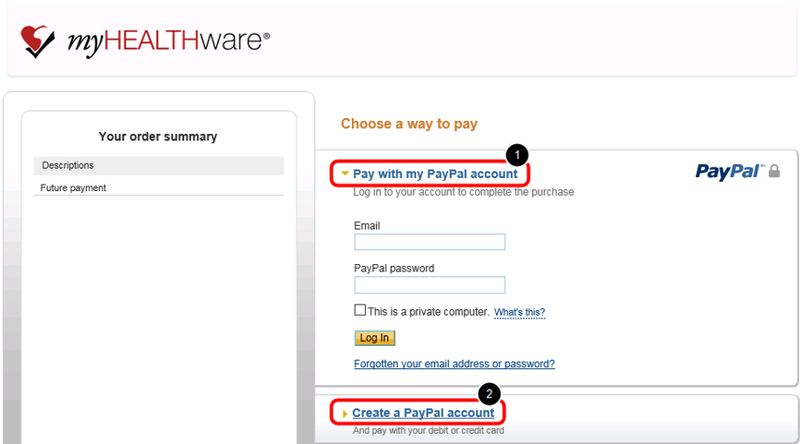 To create a new PayPal account for your myHEALTHware transactions, please click the Create a PayPal account button. Review your information and the billing agreement, then click the Agree and Continue button. After agreeing you will be returned to myHEALTHware. To cancel, click the Cancel link and you will be returned to myHEALTHware. After agreeing you will be returned to the myHEALTHware screen. Next you will choose the annual charge for Premium Subscription services. To set your annual charge, click on the Annual Charge amount (blue lettering - will default to $30.00). In the text box, change the annual charge to your desired amount. Click the Blue Checkmark button to save your changes. 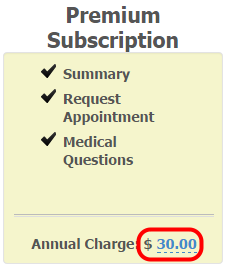 Your Premium Subscription annual charge for patients has now been set! 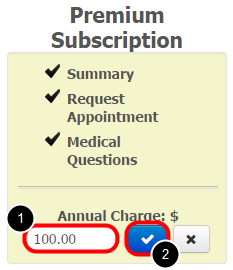 If the patient will be enrolled in a Premium Subscription, you will want to collect the annual subscription fee from the patient. It is advised that you collect the annual subscription fee upon patient checkout, before the patient leaves the office. You are now ready to begin enrolling your patients in the myHEALTHware Premium Subscription! Click the myHEALTHware icon located in the left-hand corner of the patient's chart tab. Enter or verify the patients email address. 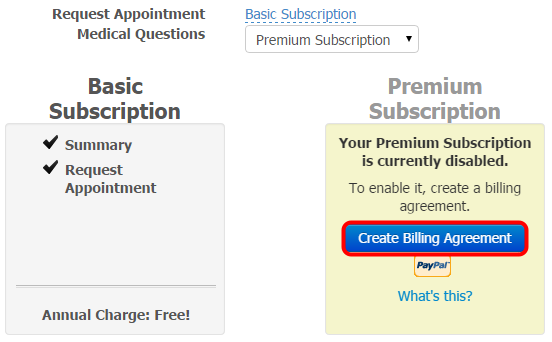 Using the drop-down menu, select Premium Subscription for the patients Role. 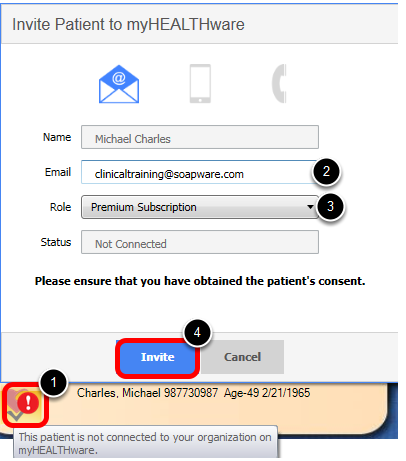 Once the invitation has been sent to the patient, the myHEALTHware status will display as "Invitation Pending Acceptance" (see the screenshot above). It will remain in this status until the patient has accepted the invitation and completed the myHEALTHware registration process. A PayPal transaction will now be processed for the patient that was signed up for premium subscription services. 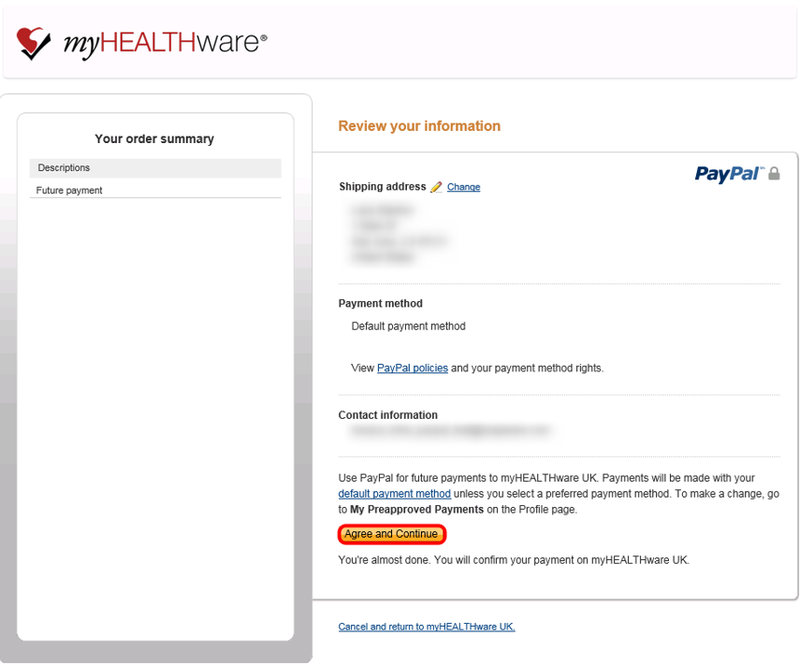 You will see a transaction from myHEALTHware on your PayPal account for 50% of the myHEALTHware premium subscription price.